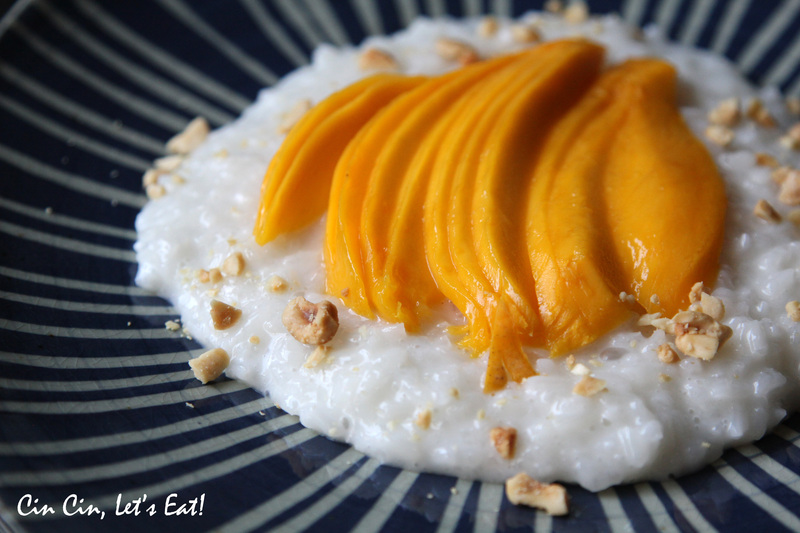 Coconut Milk Sticky Rice with Mangoes [recipe] – Cin Cin, Let's Eat! While shopping at Wholefoods this week, I spotted some real good looking Manila mangoes aka Champagne mangoes, 5 for $5! It got me craving all sorts of tropical things, but the one thing that I really wanted was a Thai dessert- mangoes on coconut sticky rice. When I got home I decided to just go with my instinct to make this dish without doing any recipe searching online. I did make one huge mistake while cooking the glutinous rice with my rice-cooker. It’s usually a 1:1 ratio, and I only used 1 cup of rice. But due to my usual habit of cooking 2 cups of rice at a time, I threw in 2 cups of water without thinking twice, thus the rice turned out almost porridge like….I tried to steam it longer to let the water evaporate more but it wasn’t too effective. Oh well, it still tasted good! Next time I might attempt to cook the rice directly in coconut milk…you think it’ll work out well? handful of crushed roasted peanuts. Soak the rice in water for at least 1 hour to overnight. Using a steamer or a rice cooker to steam the rice. If you are using a rice cooker, use 1:1 ratio of rice to water. If you are using a steamer or a covered wok, put about 1-2 inches of water in the steamer/wok. If you are using a bamboo steamer, put the rice on a sheet of cheesecloth so it doesn’t fall through the holes, make sure the rice isn’t submerge in water. The rice takes about 20-25 minutes to steam. When the it is done, the grains will appear somewhat translucent. While the rice is steaming, prepare the coconut milk mixture. Add sugar and salt to coconut milk, bring to a simmer. Set it aside to cool off. Just like heating up cream, don’t let it boil. Once the rice is done, add about half of the coconut sauce to the rice. Mix and let the rice absorbs the sauce. Add more sauce if needed but the rice shouldn’t be too wet. For the remaining sauce, you can thicken it over the stove with a cornstarch slurry and use it to drizzle over the finished plate. You can also use condensed milk instead. 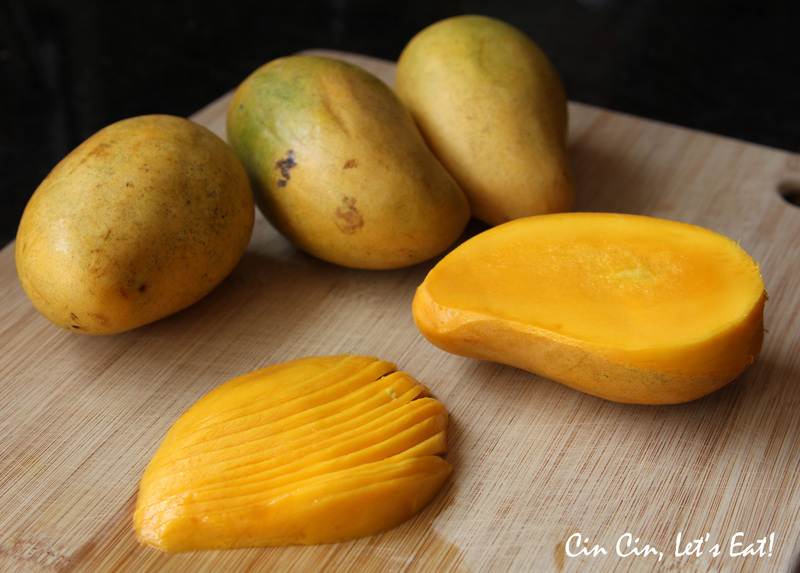 Peel the mango with a fruit peeler, cut along the two flat side of the pit, you’ll end up with two big pieces. You can cut them into cubes or thin slices. I Thinly sliced each piece length-wise to create a fan shape. To plate the dish- a mound of rice first, topped with some crushed peanuts, then place the mango slices on top in the center, drizzle thickened coconut sauce or condensed milk to finish. Oh all three of my favourite foods….looks delicious! Was thinking about making rice pudding with a bag of sweet rice someone gave me. Going to make this instead. Just hoping it turns out since I have coconut cream, not milk, and my mango slices are frozen. I love this dish.